We shall see. These reports often over-exaggerate what we will really get. Not that I would complain. I mean, even if we get the low end of what is predicted for my hood, 8", that's a lot of snow. But like everyone else here in the North Pole, I went to the grocery store the last two days to stock up. Just in case. And I made soup last night (new recipe: potato broccoli cheddar). I have plenty of coffee and Diet Coke. And a snugly puppy. So as long as I don't lose power, I will be safe and sound, blizzard or not. 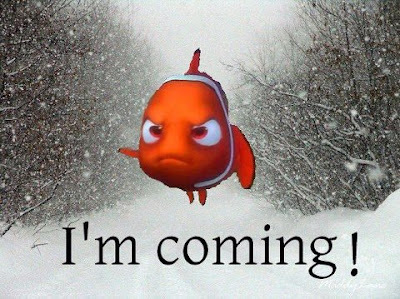 Very jealous of Nemo, We have gross rain down here. Would much prefer snow! Enjoy the snow! I hope your power stays on and you enjoy a few days indoors. Love the graphic! We are on the very edge so we are only looking at a few inches of snow. Stay safe everyone! Oh come down here. Sunny and low 60's tomorrow. We're taking Sam to the zoo this weekend! Miss you. I hope you get enough snow to be beautiful, but not enough (like Boston) to be miserable afterwards. It's time like this I miss the East Coast even more!